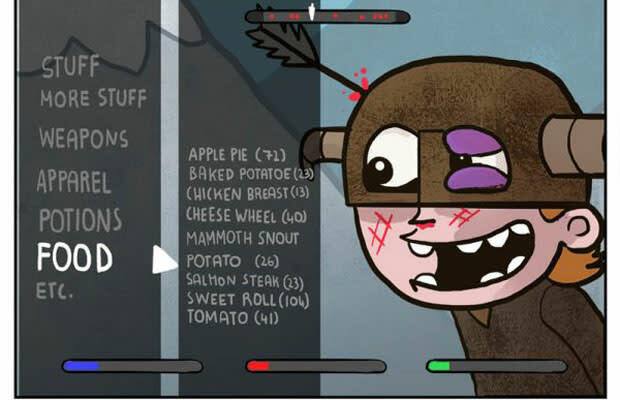 What do you do when your health is low in Skyrim? Besides magically pausing the entire world so you can spend five minutes sorting through your hopelessly cluttered inventory, you obviously stuff your face with whatever scraps of food and random raw vegetables you happen to be carrying. Of course, it&apos;s hard to say much of anything, much less get out a coherent Dragon Shout, when your mouth is full of potatoes. Check out the full comic over at Dorkly and let us know any tips to get your health back up in Skyrim in the comments or on Twitter.